The Wright Brothers were not the first to come up with the idea of air flight; a small handful of scientists all over the world were already working on it. 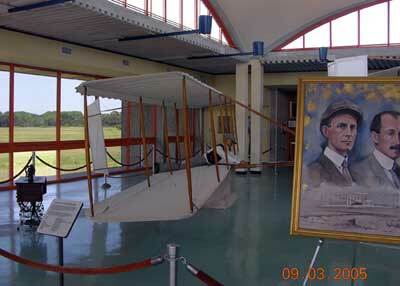 However, in 1903, Orville Wright was the first man to actually "fly" off the ground. Though it only lasted 12 seconds and the flight lasted shorter then the length of one of today's airliners, he indeed flew from their choice spot on Kill Devil Hills, North Carolina. 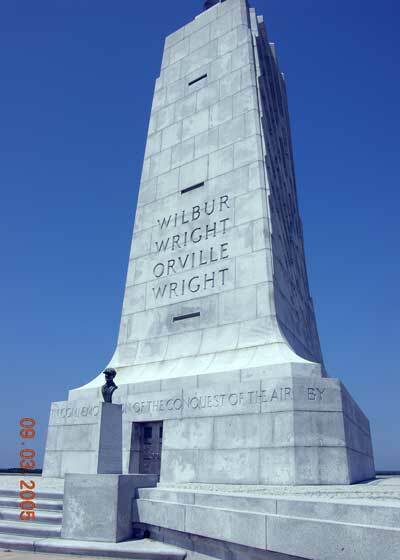 The Wright Brother's monument, is about the first 4 flights of the brothers attempts at flight. 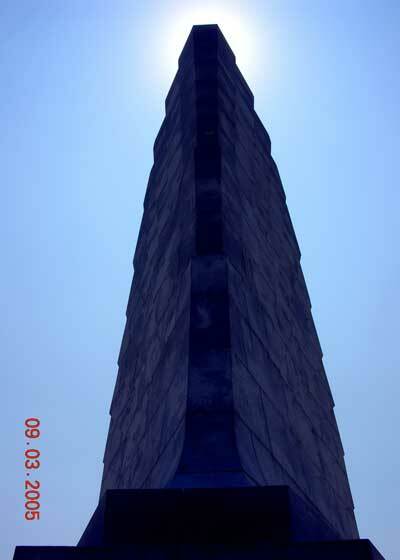 At this site, you will see: The main monument, which is on a hill and commutates the Brother's triumph. It's quite a walk up this hill; I was very winded! Wear good walking shoes. NO food or drinks are allowed anywhere on these premises and no food or beverages are available anywhere on the grounds. You'll have to go a few miles away for restaurants. I do believe you may be able to take water in, but that's it. The rest of the grounds include: 5 markers...one at the point of take off and four more, commemorating the flight distances. There are 4 out buildings: one is a lecture center and you can go inside. Inside are a small amount of exhibits to see. Here you can learn about the Brothers, the parts of the planes, a timeline of flight and the grounds. There is also a small theatre where you can hear lectures. There is also a small gift shop here as well, and restrooms and a water fountain. Back outside, also another building is the visitors center where there is information, more displays, some paintings, restrooms and water fountains. You can here a lecture here as well. You may ask for information and pick up pamphlets to other nearby attractions too. 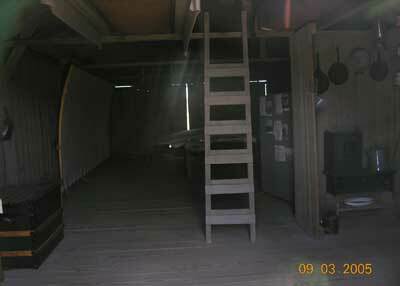 Back outside are two small wooden structures, one room each, which are replicas of the camp the Brothers shared with their helpers. These helpers catalogued all the information about the flights, did maintenance and helped ready the flights. There's nothing else to see, and the whole tour will take no more than one hour, maybe an hour and a half if you take your time and read everything. Bring good Walking shoes, bottled water only, jackets in cool weather as winds on the hill are great. Small children will tired walking the hill, so bring strollers or carry up. People with medical problems should probably ask about walking the hill or for special assistance. I believe the old textbooks that say "Kitty Hawk" is where they took off is only semi-correct. 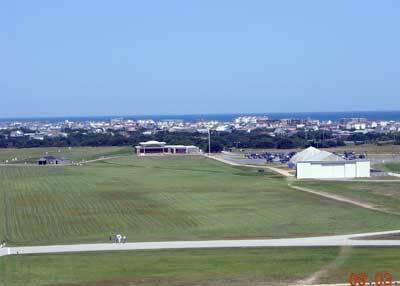 Kill Devil Hills is near and maybe even part of Kitty Hawk; but they are two separate entities. 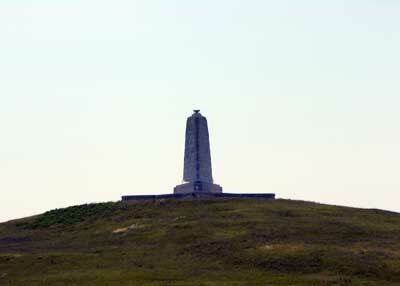 The brothers lived in Kitty Hawk and actually flew in Kill Devil Hills... both are part of the "Outer Banks" region of NC. Cost: is $3.00 for adults, Kids under 16 are free, Seniors 62 and above are free. Hours: 9am-6pm in the summer and 9am-5pm the rest of the year. Open year round. 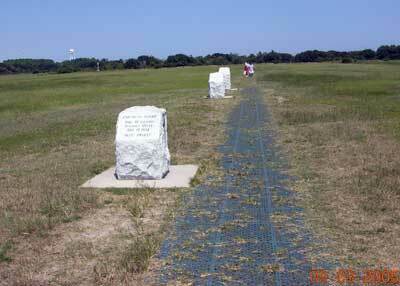 Location: The park is located on the Outer Banks of North Carolina in the town of Kill Devil Hills. The Visitor Center is 15 miles northeast of Manteo, NC on US-158. 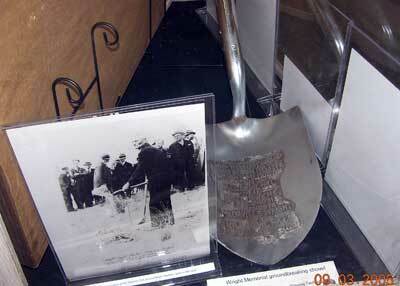 Left to Right: 1) An overview from the hill where the monument is to the whole complex below 2) A view of the monument on the hill 3) In the lecture center; a shovel presented to Wilbur Wright on the occasion of ground breaking of this monument's site. 4) Inside the Visitors Center: A model of one of two planes 5) The Markers of the first 4 flights where the plane landed on the first tries.